Right now professional bloggers cannot avoid the impact of Social network and media sites to bring traffic to their blogs and websites. So adding a social sharing button on a website is necessary nowadays. We can see many third-party tools which offer the facility but now Blogger is also offering an official social sharing button for blogs in blogger platform. It helps to share the blog posts in social networks like Twitter, Google plus etc. Sharing blog posts in Google is very easy now by using this new inbuilt feature. This tutorial explains this new Google feature and how to utilize it to bring more traffic. How can we integrate this social share button on blogger blogs? It is as simple as to check the show Share button on page elements in the layout. If you like to activate this inbuilt future, follow the steps below. Click on Edit link in "Blog Posts"
You can specify the location of the Share button in a blog post by arranging the gadget position by drag and drop method. For some templates by just checking the "Show Share Buttons" is not enough to display the Blogger official share button. If you are using older templates, you cannot activate this feature by simply following the steps mentioned above. In that case, you need additional tweaks to bring this feature on every post automatically. In the last blog post, we discussed how to enable Blogger official Social Share button on Blogspot blogs. However, at least in some blogs, this trick is not working. Even though we enable the feature, Show Social Share in layout, it is not displaying under blog posts. So let us check what we can do if this feature is not showing up on a blog. The best option is to add the share button (including Google plus) code manually in a Blogspot template just below the posts. Before jumping to this, it is better you read the previous article about steps to enable the share button. Link to that post is provided at the end of this tutorial. Now paste the following code just below it. Now onwards Social Share button will be displayed under every blog posts. Just like adding this feature, it is important to own a custom domain name for your blogger site. To do this click on the link below. After adding a custom domain name for my blogger site, I faced one issue. Links without WWW prefix of my blog were not redirecting to WWW version. I fixed this by following the steps listed in the link below. Adding Social Share button under blog posts will increase the chances of post sharing by your blog readers. It automatically improves the traffic to the blog. So the next step we need to do is placing Google Adsense code at the right places on your blog template. To do this follow the link below. Sharing published posts in social network sites with author account gives more credibility to your blog. Having a unique favicon instead of default blogger favicon will provide additional credibility. To do this click on the link below. Thank you for an easy fix! Was going crazy trying to figure it out. I am glad to hear this post helped you. I tried it but it's still not working I'm afraid. I couldn't find 'Expand Widget Template' so maybe it was to do with that? It is strange you cannot find "Expand Widget Template". 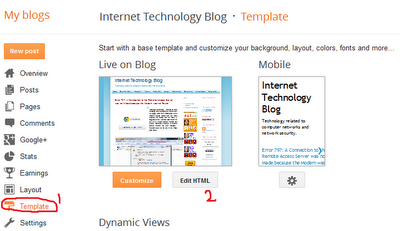 Are you using current Blogger template ? May be this link will help you. Blogger has changed "Expand Widgets" is no longer an option. The expand Widget option is no longer available. Now after you click the "Edit HTML" it will redirect you to a page with "Back" "save template" "jump to widget" and other buttons. I noticed that the jump to widget has drop down menu. Anybody can help us out on this? Thanks a lot! It seems they have changed the format already because after I click the Edit HTML button, they will redirect you to a page with "Back" Save template" "jump to widget" and other buttons. The expand widget checkbox is o longer available in the page. Any other options aside from this? Thank you! This alternative doesn't work. Tell me where can I find the "expand widget templates" with the new blogger format? I have updated this blog post according to the new blogger template. Please try the new method listed in this article. Thanks admin for updating your post based on new format. you're looking for, submit a request and we'll be glad to help. Have you checked the checkbox at "Show Share Buttons"?